Every day, the average American is exposed to up to 10,000 advertisements, and this number is growing as ads are now found on social media or hidden in less obvious places. Learning how to connect with your audience and influence their purchase decision is vital to keeping up with the competition. But with the popularity of online advertising, many wonder, why use print media for marketing? According to a survey of over 1,000 U.S. consumers, advertising through print media has been found to create the most influences. If that’s not reason enough to take advantage of print media advertising, keep on reading to find out how print media is also influencing buying decisions. When social media advertising became the new trend, many companies thought that it was replacing traditional channels like print media and television. However, magazine readers are also bringing their conversation online. Thanks to print media ads, associated Instagram account saw a huge spike since 2016. Your magazine or print media platform can bring your customers to your web site and social media channels! Unlike digital ads that disappear as quickly as they arrive, print media ads linger. As people keep magazines and newspapers around the house to re-read articles they enjoyed or to look at graphics that made them smile, your ad can be viewed over and over again. By using print media, you can influence more people over a longer period of time. Magazines and newspapers can be passed around the home for different family members to read or passed on to friends or coworkers. Television and the Internet are great places for people to be entertained and learn, but magazine and newspaper readers turn to their favorite publications to be motivated, get valuable information, and to get inspired by a source they can trust. Most people choose print media over TV and the web when they want to learn about a new product. 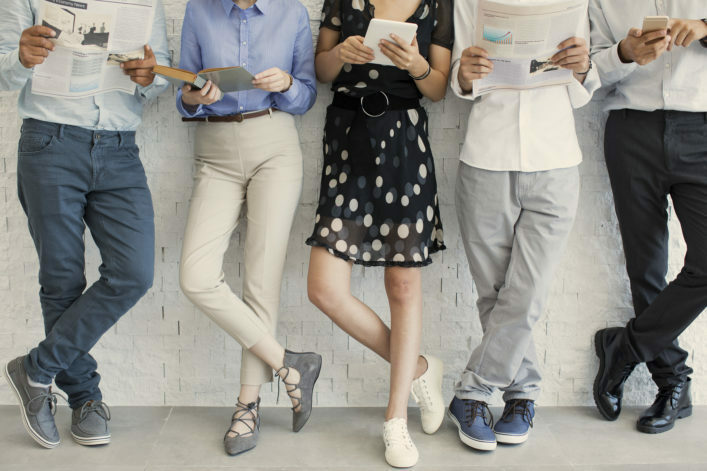 When readers want to connect emotionally or find some “down time” to relax, they turn to print media instead of dealing with the noise and overstimulation of TV and the web. Although more people are joining the digital revolution, it doesn’t mean print media is falling by the wayside. Print audiences continue to grow despite the rise of digital marketing. Consumers prefer to enjoy multiple channels of communication and in just the past few years, magazine audience has grown by about six million people. Did you know that 95% of people under the age of 25 read and trust magazines? More young people are enjoying the allure of high-quality photos and graphics, the lack of pop-ups and interruptions, and durable messaging that is available for consumption over and over again. Paper-based reading stimulates emotions, drives sensory involvement, and enables more focused attention. Most people, when looking for something to read, would rather pick up a magazine, than search for information online, especially when looking for something trustworthy. Although digital searches make accessing information instant, books and print media continue to be the more sought-after source of trustworthy, factual information. In terms of success, magazine advertising campaigns do great. They work well on their own, and in conjunction with other efforts. When print is added to an online or TV campaign, response rates increased significantly. This isn’t just because of the added exposure—numbers show the most positive variable amongst the forms of media is a print campaign. Online print on its own boosts engagement by 10% and TV alone increases engagement by 13%. When print media is added to the mix, a 15% increase in brand awareness is achieved. Magazine and newspapers are far away from being obsolete. They have become a part of online and televised marketing campaigns to make brands appear more trustworthy. As more consumers take breaks from the bombardment of digital ads, you can reach out to them with valuable information about your products and services as they read during their down time. Advertisers should remember the value in print advertising and keep it as a staple part of your marketing campaign. Print newspaper advertising continues to benefit companies globally, but it takes know-how and creativity to execute an effective campaign. If you need help targeting your audience and getting them inspired and engaged with your ad, we can help. At Macromark, we can help you learn how to improve your marketing strategy by creating print media ads that interest your prospects and appeal to their emotions and ethics. We can also help you stand out from your competitors, which is essential to growing your customer base and getting consumers to visit your store or web site instead of someone else’s. We can help you set up a successful print ads campaign, as well as provide valuable and trustworthy information, advice, and assistance to get your campaign up and running.